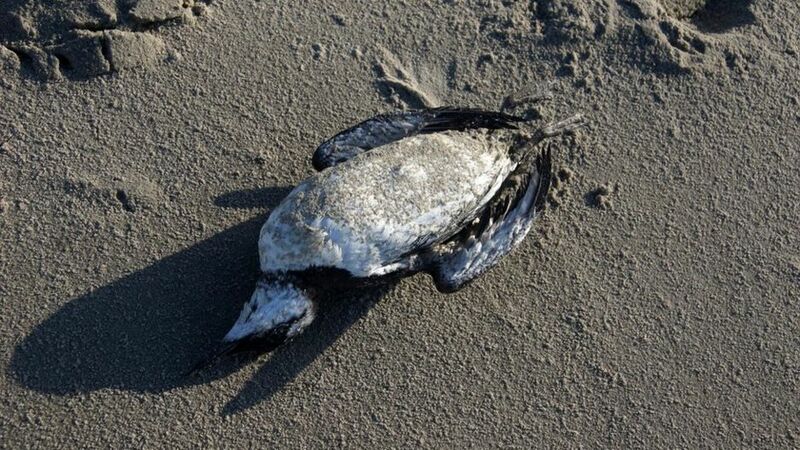 SNIP: Scientists are trying to find out why some 20,000 guillemots have died in recent weeks along the Dutch coast. The birds were all emaciated and there are fears they may have been victims of a spill from the MSC Zoe container ship, from which some 345 containers fell in the sea during a storm. “There’s no smoking gun, but we’re looking into it,” says Mardik Leopold, who is investigating the deaths. Chemicals may be to blame as most plastics are hard to ingest, he says. Hours after the containers fell off the MSC Zoe in a storm, they started washing up on islands off the Dutch north coast on 2 January, spilling their contents of children’s toys, furniture and televisions on to the beaches. A bag of peroxide powder was also found.